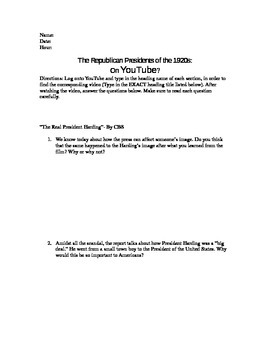 This is a webquest using YouTube and Google as the research sources in order to help students learn about the Republican Presidents of the late 1920s. Student will already need some background information on the 1920s in order to completely comprehend this assignment. This would be a great activity for students of all learning types for it includes music, auditory learning, and visual stimulation, instead of reading out of a textbook.